(Press Unit in the Office of the Prime Minister) – In a powerful address to wrap up the Budget Debate in the National Assembly on Tuesday, 12th December, 2017, Prime Minister of St. Kitts and Nevis, Dr. the Honourable Timothy Harris, effectively defended the EC$706,129,036 million budgeted for the upcoming financial year by the Team Unity Administration. On Wednesday, 6th December, 2017, Prime Minister Harris announced a tax-free and balanced budget for 2018, the third straight year in which his Team Unity Government has done so. Dr. Douglas’ response to the Budget came on Thursday, 7th December, 2017. Prime Minister Harris pointed to the hypocrisy of the former prime minister, who sought to inject mischief in the Diaspora by referring to the 2018 Budget as a ‘manipulation’, when it was under his leadership that St. Kitts and Nevis was forced to borrow EC$227 million from the International Monetary Fund (IMF) under its Stand-By Arrangement in 2011. “After 20 years, Dr. Douglas has the dubious distinction of being the first leader from adult suffrage of 1952 to have taken the country to its knees as a bankrupt and failed state. Even Haiti in 2011 recognized internationally, because of all the overthrows, as a failed state had a lower Debt-to-GDP ratio than St. Kitts and Nevis. Douglas made St. Kitts and Nevis a failed state, a pariah nation [and] the poster child of the most mismanaged state in the Western Hemisphere, and indeed in the world,” Dr. Harris stated, adding that the opposition leader caused St. Kitts and Nevis to break from the prudent fiscal management of Heads of Government before him: the Right Excellencies Sir Robert Llewellyn Bradshaw, Sir Caleb Azariah Paul Southwell, Sir Lee Llewellyn Moore and the Right Excellent and Right Honourable Sir Kennedy Simmonds. Prime Minister Harris contends that it is as a result of the proper management of the country’s fiscal resources that his Team Unity Administration will this week pay a historic 13-month salary to all civil servants, pensioners, Government Auxiliary Employees (GAEs), Skills Training and Empowerment Programme (STEP) employees and workers at all Statutory Corporations for a second consecutive year. 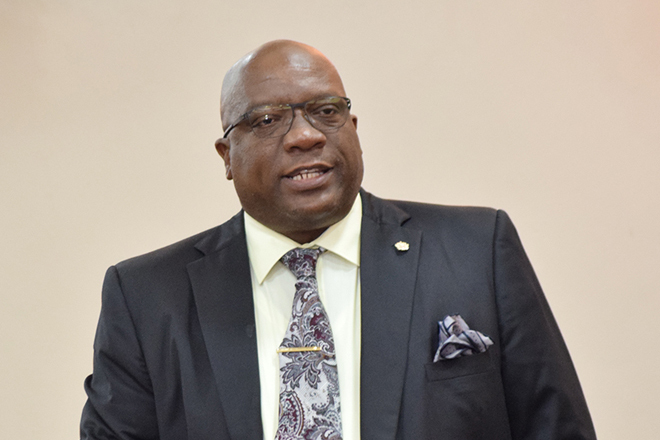 Dr. Harris also noted that the Government will make payments of severance and long service gratuities totaling $1,631,316.09 million to 157 persons, 112 persons who worked in St Kitts and 45 persons working in Nevis.